Today, I dedicate this space to honor the 44 Special Action Force policemen who died in the line of duty in Maguindanao. While we have yet to piece together the details of this botched operation, while we ask the hard questions and demand for accountability, while we press for justice for the dead and punishment for the guilty and the responsible, today, we take the time to thank our fallen brothers for their service to the country. Many of them were young men in the cusp of their lives. They never complained the hard lot of a policeman’s life. They left behind their families and the comforts of homes, ready to be thrown at a moment’s notice in hostile territory to fight for the one thing they will never know in their lifetime – peace. 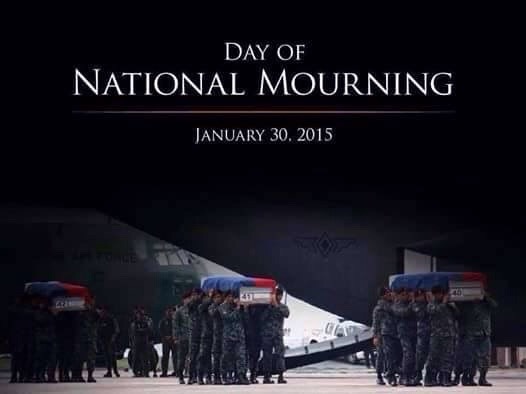 And they never begrudged the Filipino this thankless, often lonely, duty. My grandfather was a policeman. When I was growing up, he used to tell us stories culled from his years of service as one of Manila’s Finest. We used to think of them as “adventures of daring and exploit.” We clapped our hands in glee whenever he reached the parts where bullets whizzed over their heads and small children that we were, we always asked for more. We never gave a second thought to the danger and risks he and his comrades took. It didn’t occur to us that all his stories could have gone the other way, that he could have been injured, or worse. They were all just stories to us. When I was older, I asked him why he chose to go into the service. By then, I knew about the reality of being a policeman. The low pay. The long hours. The inadequate material support in equipment, ammunition, even uniforms. Our men in uniform serve as the wall that protects us from the horrors of hate, evil, and war. Today, we grieve the loss of these 44 young men who gave up their lives so that all of us may be a little safer in our homes, in our communities, and in our country. They never sought merit or glory. They never dreamt of money or fame. I bet if we could ask them why they bravely laid their lives on the line, they’d tell you the same thing. And that somebody was them, the 44 fallen braves of the Special Action Force and their brothers in service who risk their lives daily for us. I wish they knew how much we appreciate their bravery and service. Anyone who has ever lived through these last few days is not likely to forget. Much like Typhoon Ondoy in 2009, the devastation these days of unrelenting, unremitting rain have caused is of a magnitude no one ever imagined was possible. 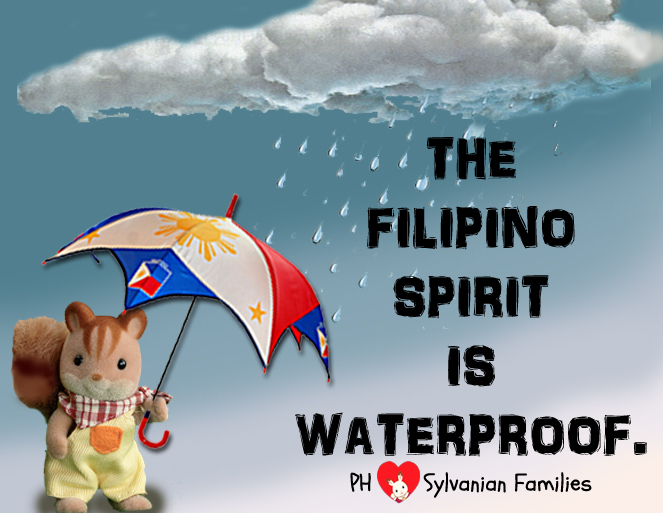 Typhoon Ondoy was not a fluke weather disturbance, as we were all led to believe. It was a portent of things to come, a preview of how a whole city can be transformed into a Waterworld. There is no typhoon over Metro Manila. And yet we are deep in floods, many as high as two-storey buildings, as we are slowly and willfully undone by what others call an Untyphoon. We are experiencing monsoon rains of unbelievable intensity and duration such that close to 90% of the whole metro have been crippled by massive flooding (with half still flooded). It is heartbreaking to see, the sight of once bustling cities turned into murky pools of deathly water. I live in high ground so I am removed from the greatest threat of flooding. But the rains have not spared us either. There is water damage everywhere, as water seeps through our walls and ceilings, soaking and ruining everything in its path. I can’t sleep well as I worry about the extent of damage to my home, even to Alphonse’s schoolhouse. And yet I can’t help but feel immensely lucky. We are here, complete. Our home is still standing, and despite leaks and weeping walls, we are generally dry. We have enough food and drinking water for a few days. I can’t worry beyond the here and now so I focus on the good things that keep us going. We are alive. And we will survive. A few nights ago, I slept with a heavy heart, my eyes sore from weeping. Monday, while the whole world watched live on television, fifteen men and women were held at gunpoint for over eleven hours, trapped in a tourist bus in the middle of Manila’s Quirino Grandstand. It’s hard to believe that just more than a hundred days ago, the Quirino Grandstand was a sea of joyful yellow, the venue of a country’s pride. The inauguration of the newly elected President was a cause of national celebration. After years of unwanted rule, we finally had a chance at a government we wanted. Sadly, all that goodwill seems to have been wiped out by an indelible act of violence. By night’s end, what was once a venue for celebration had become that of despair, notoriety, and murder. Eight hostages were dead from the hostage taker’s hand. The gunman, once a decorated police officer, lay sprawled across the broken bus door, dead from a bullet to his head. In the aftermath of these long hours of madness, Facebook, Twitter, and other social networks were rife with complaints, insults, and harsh words on the conduct of our police. Many of them, while hurtful, are undeniably true. Monday’s hostage crisis showed the police force’s glaring lack of training and preparation. It exposed, much to our shame and dishonor, the conspicuous holes that riddle this once honorable institution. And yet, it is only too easy to pass judgment and rail at police incompetence from the safety of our own homes. Without knowing how it is to lay your life on the line, it is easy to crucify them for their lack of discipline and training, their slow response time, their seeming indecision, their deficiency in strategy, their shortage of knowledge on onsite crisis management, and even their apparent ignorance of crowd control. However much we detest their action- or inaction- that night, we all saw, too, that these same men stood in the pouring rain with hardly anything to protect them from the elements, much less the bullets of high-powered assault firearms. They had no Kevlar vests and helmets. Many had no shields. They had no gas masks to face the biting sting of the tear gas on their face, or night vision goggles and scopes to handle the dark interior of the bus, or even surveillance equipment. As the television showed us all too clearly that night, even their tear gas canisters were sometimes duds. Yesterday morning, I opened the television to tune in to the Teleradyo station on cable, with broadcaster Noli de Castro on the line. He criticized the conduct of the police, claiming that the new president will have much work to do to fix the police force. As an afterthought, he added, “Akala ko kasi okay na nung kay GMA.” (“I thought it was already okay under GMA (Gloria Macapagal-Arroyo).”) But wait, wasn’t he vice-president then? He was the second highest public official of the land, and he did not know the state of police readiness in the country? Was he kidding me? The appalling shortcomings the police showed that night are the result of years of mismanagement and corruption not only in the force, but in government. For far too long, a culture of blind loyalty and patronage politics existed as the only means to get ahead in the promotions game. And far too often, the abuses of high-ranking government officials have gone unpunished while those below are left to wallow in meager salaries and substandard equipment, if any. Yes, mistakes were made right and left, and these cost many lives. I grieve with the families of those who died in that bus and I reach out to them, through the void of the Internet, with the spirit of humble apology and atonement. I pray for their heartache and their loss. And I join the voices of the people who demand that action be taken to make people accountable for their mistakes. It is time to make the police honorable again, and this time, there can be no excuses. Still, I do not wish to join the wholesale condemnation of the entire Philippine National Police. 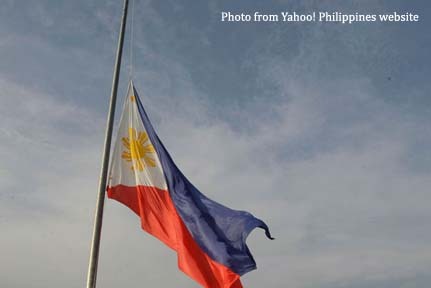 Many of them, I believe, are still men of valor and honor, willing to lay their lives in the defense of the common man. As a granddaughter of a deceased policeman, once one of Manila’s Finest (his life was remade into a little-known Sonny Parsons movie called “The Fastest Gun Alive”), I know only too well the hardships and sacrifice these men live with in the performance of their duties. My grandfather, at the end of his life, died a poor man, but he died with pride at his own legacy as a policeman and an officer. Let this taint on our nation’s soul be a constant reminder to all those who might forget that the price of negligence and arrogance is life. Forgive me if I keep writing about water; it’s the only thing that consumes my mind these days. I am appalled that people in goverment continue to insist that there is NO water crisis. What does it take to make this a real crisis? Listen up, Mr. Lacierda! For goodness’ sakes, it’s all over the news! We’re talking about more than two million people affected. It makes me angry that Mr. Lacierda, the President’s spokesman, insists that “It only affects areas serviced by Maynilad.” Dry taps, dead toilets, even rationed drinking water- and there is no crisis? Already, there are fighting and jostling in long, unruly lines. People wait for hours to get relief that comes without schedule or organization. And when it comes to situations like these, without leaders to guide the way, it becomes every man for himself. I am disappointed that the government is taking its own sweet time in responding to this crisis. They say that the solutions are in place but where are they? What are they? From barangay to city to national level, there seems to be no immediate response to this crisis other than to point fingers, blame the weather, and enjoin the people to prayer. I am parched and tired and mad as hell. 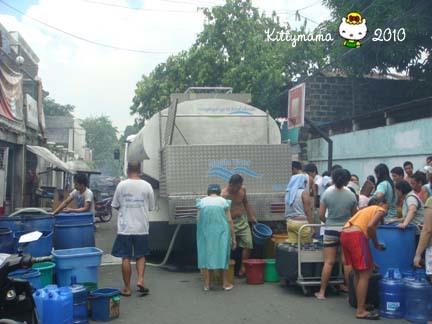 Yesterday, however, a water tanker finally made it to our street. 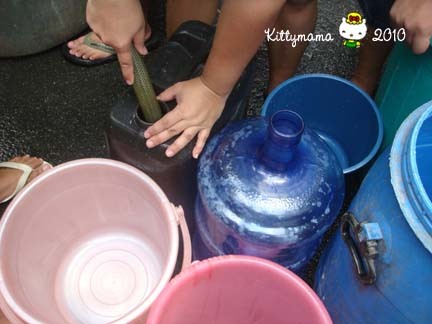 After I called Maynilad last week, and called them twice more to confirm action on my request for water, we finally caught sight of the delivery men. We ran as fast as we could, bringing pails and buckets and five-gallon containers and just about any kind of receptacle we could grab. One of our neighbors didn’t want to share at first, claiming that they were the priority case, but when confronted by loud and indignant neighbors, they backed down. I was lucky, I didn’t have to fall in line too far behind the first bucket. Still,with people trying to sneak in through the lines and many more with humongous pails that dwarfed mine, it took me close to three hours before I filled all of my containers. At first, it was all bedlam and confusion as people jockeyed for positions closest to the hoses. Amid the din of voices, however, my protests for calm were heard and my neighbors, mostly strapping young men, finally started working together instead of against each other. I even got them to help me bring pails of water to an elderly neighbor down the street. A young female neighbor helped me and the nannies carry the bottles of water back to our place. Then too, my four-wheeled pallet came in handy, helping an older neighbor carry a large covered pail to her home without much effort. By the time the tanker was drained dry, we had all helped each other. It was classic bayanihan* in action and for once, I felt proud to be part of this little community. So last night, for the first time in almost two weeks, I slept soundly, confident that we have enough water for a few days, at least. I doubt if the worry and anxiety will cease; after all, the problems- unusually prolonged hot weather and low water levels, worsened by inefficient water utility service (talk about a 53% nonrevenue water level or lost water for Maynilad – this means more than half of water they get from the dam is lost or spilled- sheesh!) and dam problems (leaks, maintenance problems)- are still here, unsolved as the day the water disappeared from our taps. But for now, I will give thanks for the little graces and the little miracles that God sends to remind us that despite fear and worry, He is very much around. Up until you announced your candidacy, I had given up hope in the election process of 2010. While I have exercised my voting rights judiciously in every election since I turned eighteen, years of ineffective, dishonest governing have made me jaded and worn me out of any shred of hope. And then you came along, and for the first time in many, many years, I felt I had something to look forward to. This child of the Marcos era, who slept through much of her adolescence in an apolitical and apathetic slumber, who resisted the call for the revolution in 1986 because she was too busy studying, is putting her hopes for honest change squarely on your shoulders. I pray for a change that will come in my lifetime and continue in my children’s and their children’s lifetimes. Your popularity does not surprise me. I share the sentiments of many people who have felt indignant yet helpless at the shameless and callous displays of behavior of our present government. But while your popularity may help you in the course of the campaign, it has also opened you to vicious attacks from your opponents. Allow me to say outright that I do not believe you have autism. I may not be a diagnostician, but having lived with autism every single day for the last fifteen years of my life, I know what autism is firsthand. I have witnessed it up close, lived with all its blessings, and survived almost all its challenges. What I know of it, I know not only from books, from the Net, or from research and published papers. What I know of it comes from real life. 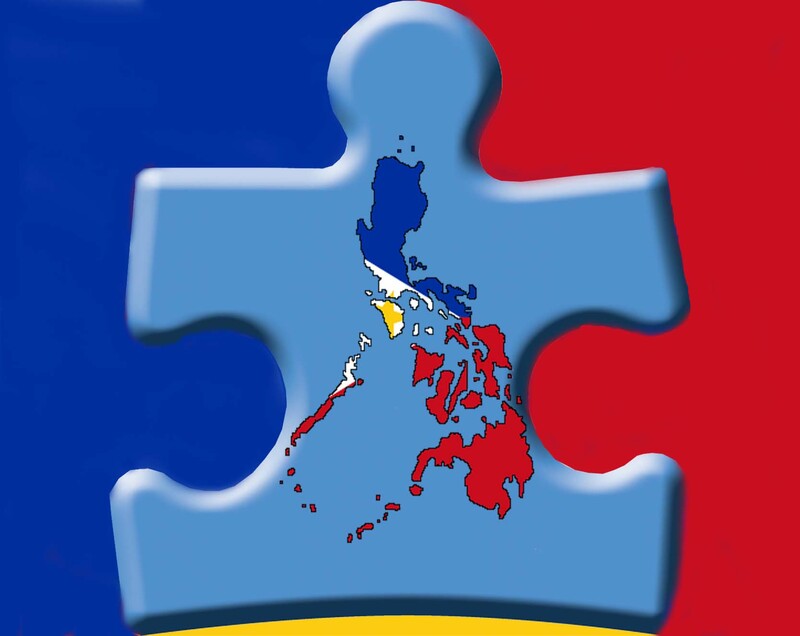 As an advocate for autism, I am proud to be part of the large community of families of Filipinos with autism, which at last count, numbers close to half a million affected individuals. That being said, let me posit a question: If you were one, what is absolutely wrong with it? Autism is difficult and challenging, and to those of us who love persons with autism, it is a rollercoaster ride every single day. Is it a disability? It is, but it also is not; it depends on how you look at it. And yet, when you really think about it, ravenous greed is a much harder disorder to treat, as are immorality, shamelessness, corruption, and vice. I have heard of recovery in autism, but diseases of the soul are almost always incurable. It being autistic means not being able to steal, to use public funds for personal gain while the country wallows in poverty, then I am staunchly autistic. If being autistic means satisfaction with what one has, if it means a characteristic lack of greed and materialism, then I count myself autistic. If it means not being envious and not judging people based on looks, money, connections, or pogi points, then, yes, I am autistic. The day you do, you have championed the cause of the least able of our people. And for what it’s worth, you still have my vote. And so we ask the question: what do we look forward to this year? Well, click on Autism Beyond Borders to find out everything you need to know about the conference. Allow me, however, to whet your appetite. We’ve got a great line-up this year, with four foreign speakers flying from different parts of the globe to lead our learning experiences. There’s Dr. Valerie Paradiz (herself a diagnosed case of Asperger’s and mom to a son with the same condition), who will speak on learning strategies to help our children; Mr. Toshihiro Ogimura, who will talk on Daily Life Therapy, a Japanese method of intervention in use in the famous Higashi schools, including the residential program; Dr. Knut Erik Baalerud, specialist in psychiatry, who will discuss seizures and other neurologic issues common to our children; and Mr. Hiroshi Kawamura, who will help us in the blossoming of DAISY as an assistive technology for persons with autism. Of course, we have our local experts to round up the panel, with Teacher Archie David, ASP Laguna’s Riza Cansanay, OT Lyle Duque, Speech Path Jeri Casas, Teacher Hope Leyson, and Chairperson of the Commission on Human Rights Atty. Leila de Lima to speak on their individual areas of autism expertise. It isn’t often that great minds (and hearts) come together in one place at the same time, and I am definitely not passing this opportunity to drink in their knowledge. It can’t be denied that the conference gets better each time, and on the 11th National Conference, the winds of change augur auspiciously. (Did I tell you my favorite number is 11?) I invite you to be part of this historic, groundbreaking work to make a difference in the lives of each and every person with autism in our country. Come and join us on October 24 and 25 at the SMX Convention Center. Register now to avail of the early bird rates! Help us change lives. It could also change yours.